Sourdough breads taste awesome and make amazing toast. Because we love to chew on a good crust. No additives, no enhancers, just flour, water, salt and ‘starter’. Easy on the digestion, even for the wheat intolerant. Easier to extract nutrients from, so more nutritious. Challenging to make well every time – and that’s a good thing from where I’m standing. Blissfully rewarding when your perfect loaf comes out of the oven. Did I mention how good this stuff tastes? How to make a healthy sourdough starter from scratch. The benefits of sourdough bread. How to feed and maintain your starter indefinitely. The biochemistry of sourdough and how it differs from yeasted loaves. Manipulating time, temperature and hydration for flavour and convenience. Using bannetons, proving baskets and couche cloths. Lots of other great stuff not necessarily related to bread at all. This class will run from 10:00 until around 5pm. 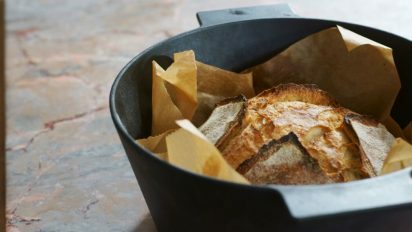 You’ll leave clutching armfuls of bread, a headful of new knowledge, a bellyful of inspiration and a fistful of recipes. In addition, we’ve hooked up with our friends at Workshop to create an amazing sourdough class app that you can download to your phone. So if you can’t get to us, we can come to you!